In August 2014,TAKRAF GmbH received an order from Vattenfall Europe Mining AG for the supply and installation of the new cross-conveyor system for the F60 conveyor bridge in the open cast mine at Welzow-Su¨d/Brandenburg. The scope of services included the fabrication respectively conversion of hopper cars and chassis as well as the scrapping of system components which would no longer be used. The special challenge of the project was the tight schedule. Thanks to the commitment and the long-standing experience of all experts involved in Vattenfall and TAKRAF, it was possible to deliver the system in ten months, as planned. Production started immediately after the award of the contract, and the first parts arrived on site after five months. In close co-ordination with the fabrication and erection team, all operational obstacles were managed to meet the demanding schedule. The hopper cars were relocated from April 2015 onwards. Thus an important milestone with regard to the mine operation was reached on time. 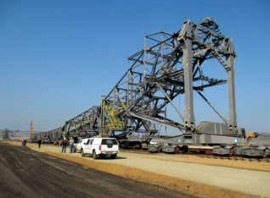 Further assembly work on the cross-conveyor took place until the end of the June 2015. The scrapping, conversion and adaptation work, which was carried out in parallel, was executed with the help of a TAKRAF transport crawler. This machine has a load capacity of 250 tonnes and had been supplied by TAKRAF to Vattenfall earlier. The next milestone was in May 2015, again on schedule, when the complete conveyor bridge was moved by about 10m in order to couple the new cross-conveyor system to the bridge. The scope of work also included the renovation of the lubrication system as well as corrosion protection at the construction site. All personnel involved in the project team in the fields of engineering, fabrication and site erection worked closely together, thus enabling the successful realization of the contract within the pre-determined schedule. Everyone involved benefited from the expertise developed over many years in complex reconstruction and modernization works, as e.g. changing the tension tie rods on the conveyor bridge in the Ja¨nschwalde open cast mine. The cross-conveyor system was able to be completed in June 2015. After three days of commissioning of the conveyor bridge complex by experts from Vattenfall, the conveyor bridge went back into mine service. TAKRAF is already working on another project at Vattenfall, i.e. changing the large bogie and the roller table at the F60 conveyor bridge at open cast mine Nochten. TAKRAF GmbH is a leading supplier of equipment and systems for open cast mining and bulk handling. Headquartered in Leipzig, the company has an additional engineering and production site located in Lauchhammer. TAKRAF’s product range includes planning, development, design and delivery of equipment and systems, including the manufacture of key components for open cast mining equipment and bulk handling systems in TAKRAF’s own workshop. The company’s equipment and systems for bulk handling are used in port facilities, storage areas, power plants, the smelting industry and in the cement industry, among other places.